There are a few quests in this town, and a couple shops. Upon first entering through the West Gate the first building to the southeast is a Common Weaponsmith. Just east of the Weaponsmith is Ivanova's shop. Ivanova identifies items and will also give you a quest to steal a book from Ernest. Completing this quest reduces your reputation by a couple points, but Ivanova teaches you the special skill Resistance as a reward. This is the only place to learn this skill, so it's really a fair trade off. North of Ivanova's shop is Londo, who provides training. The building east of the training hall is the inn, which is run by G'Kar, a Nephil. Just south of the inn is Mayor Delenn's office. He gives you two quests, though you have to complete the first quest before he gives you the second. The first quest is to clear the Golddale Mines of some Sliths who have taken them over. Once you've completed that quest he'll give you some coins and a second quest. The second quest is to get rid of some Ursagi to the east. This is the Lair of the Ursagi, and completing this quest gets you a Blessed Longsword. 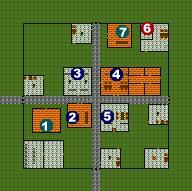 In the northeast corner of town is an apartment with quite a few traps through it. Triggering any of these traps will turn the entire town against you, so save before entering this building. In a dresser in the bedroom is a Hardiness Charm. West of this apartment is the Common Provisioner, which is the last building of note in Golddale.